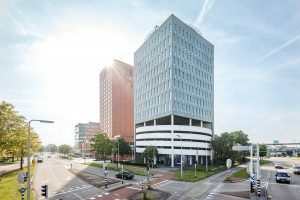 Nexus Real Estate leases the Nova Zembla building in Utrecht for 18 years to the Netherlands Organization for Scientific Research (NWO) | Nexus Real Estate B.V.
June 2018 – Nexus Real Estate has, as of 1 January 2019, fully leased the Nova Zembla building at the Winthontlaan 2 in Utrecht to the Netherlands Organization for Scientific Research (NWO) for a period of 18 years. NWO will take up approximately 4,780 m² of office space devided over 9 floors and 90 parking spaces located in the parking garage and on the outside parking terrain. The building will be completely renovated and the sustainability will be improved by Nexus on behalf of the landlord in the coming months. Amongst others, a new climate installation with cooling ceilings and LED lighting will be installed. Nova Zembla currently has an energy label A. In cooperation with the tenant NWO, the landlord will carry out a large-scale renovation and a further sustainability of the building in the coming months. These works will lead to a further improvement of the current energy label. Among other things, the central entrance, the general areas, the office floors and the sanitary rooms will be fully renovated. In addition, the current climate systems and the building management systems will be renewed. Also, the office floors will be equipped with new cooling ceilings and LED lighting. Furthermore, additional sustainability measures and the installation of a completely new office floor layout will be executed. Nexus will supervise these works on behalf of the landlord. The works will be carried out on behalf of the landlord by Klimaatservice Holland and DCV Bouw. The Nova Zembla building is part of a large real estate office portfolio that has been under management at Nexus Real Estate since 2015. With this new lease of 18 years, in combination with the renovation and sustainability works to be carried out, the Nova Zembla building has been given a new future.